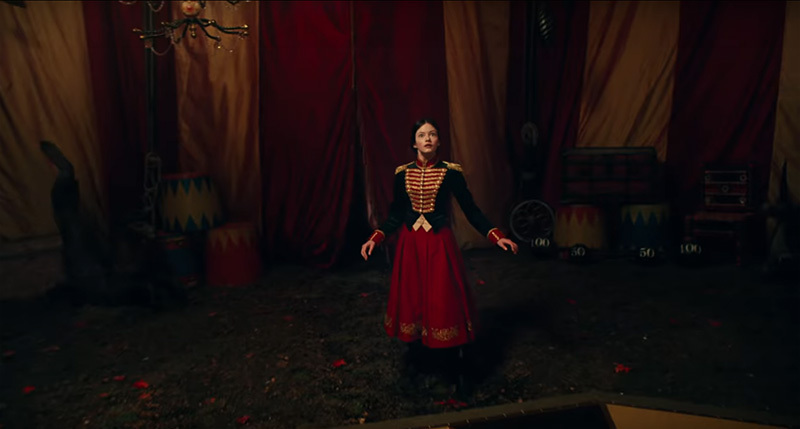 This blog post looks at the aesthetics of the new Disney film "The Nutcracker and The Four Realms", and how that can be translated into the world of events. My, that sounds like I'm writing a rather formal piece! I'm not of course, I just wanted to make a note before you read on what to expect. I'll do a follow-up post with specific theming and prop ideas soon, (after we've had a staff trip to the cinema of course!). 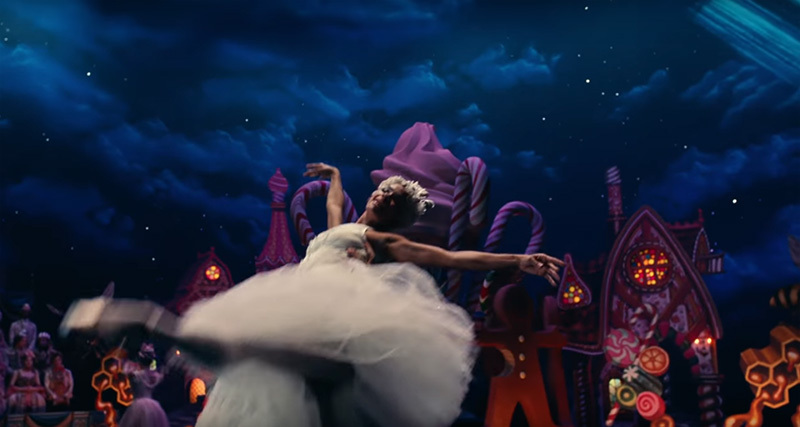 So first and foremost, I have to say I'm completely inspired by Disney's Nutcracker film - and at the time of writing this post it's not even in cinemas yet! 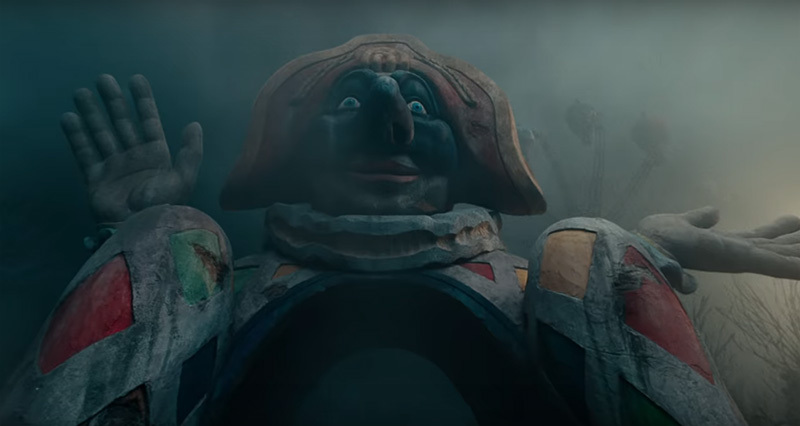 I have only seen the two trailers for it and I think it is the most inspired I have ever been. It captures everything, literally everything I love in the world of props. 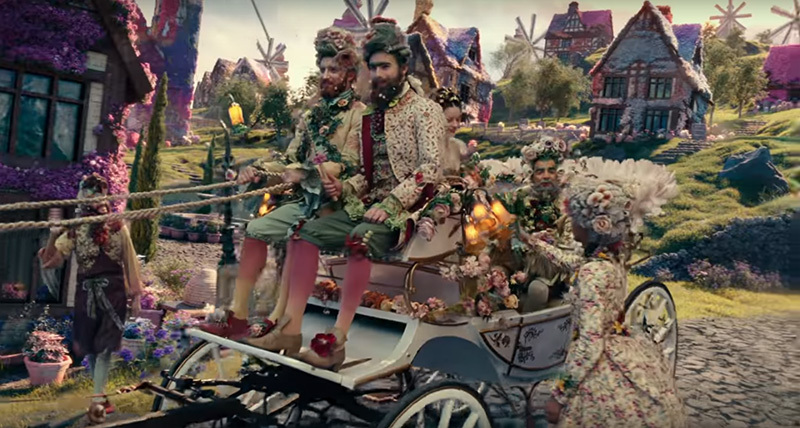 There are so many elements that can be made into an entire event theme within this one film. From vintage circus, to sweet land, icy forests, Victorian Britain, enchantment, castles, science and of course Christmas. You could have a month's worth of parties and no two would look the same. 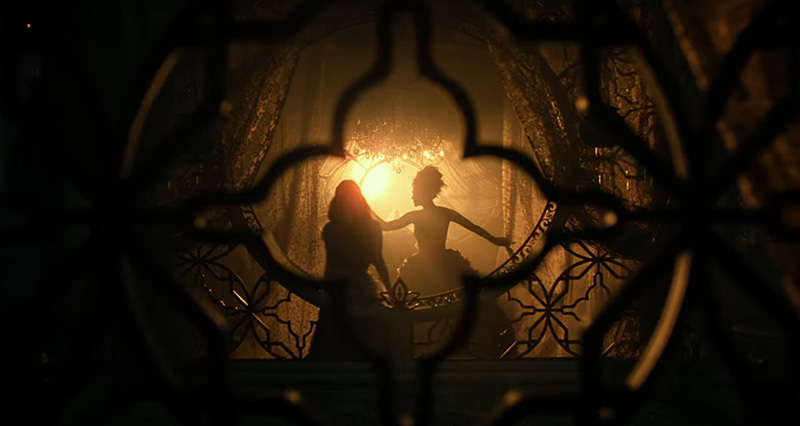 Perhaps the diversity of this theme offers an advantage to party planners as they can make their version of the film a truly unique event. But at the same time with such a wealth of themes and prop ideas to choose from it could also be overwhelming. If a client says 'I want a Nutcracker party' then where do you start?! Their interpretation might be completely different to yours. My advice would be to start with all the themes and narrow it down to one or two overall vibes, otherwise it might look like a prop shop has thrown up all over your party, or you have just gone prop crazy! 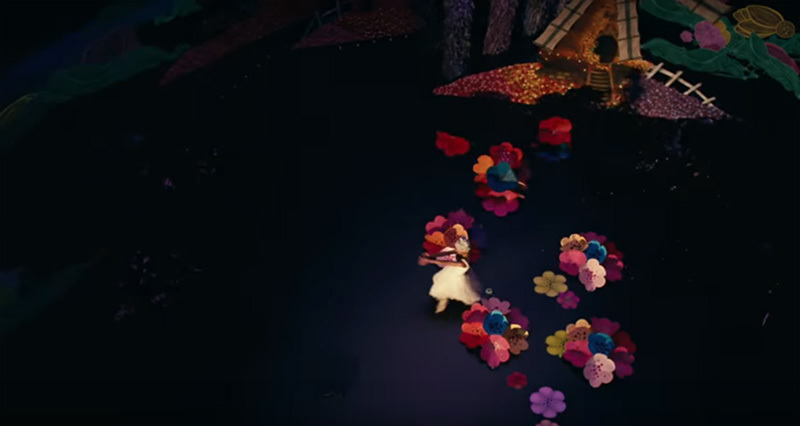 If you do want to include every element of the film then keep areas totally separate, for example having the bar area as flower land, buffet area as sweet land, the dance floor as the stage and so on. I'm happy to help you plan if you want to hire our props of course! Let's have a little look at some of the scenes from the film and how to theme your party inspired by each. 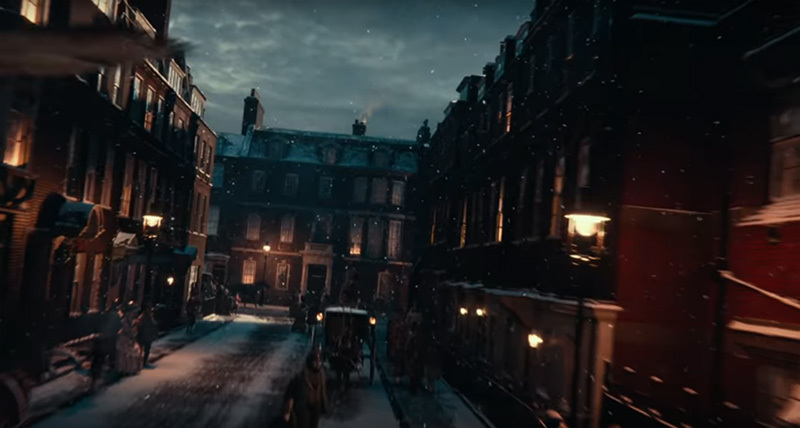 At the beginning of the film it is set in Britain, among the cobbled streets of the Victorian era. Overcast dramatic sky and a light scattering of snow, a warm glow from traditional black lampposts with horses and carriages trotting down the streets. An owl swoops over the rooftops adding a really atmospheric post-dusk feel. 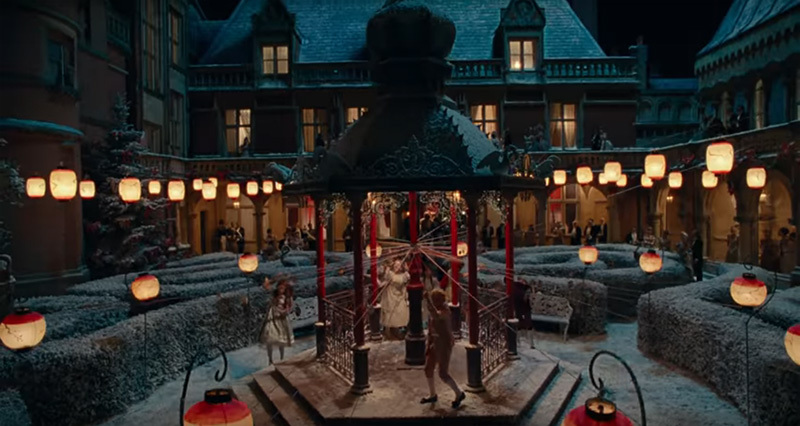 These exterior Victorian scenes aren't a huge part of the film and can be tricky to theme. I love Victorian architecture but in terms of dressing an event it can be quite hard unless you have huge fake shops and house fronts. I'd suggest that a few Victorian lampposts outside the venue would suffice. The interior set for Victorian Britain is much easier to recreate. If your event is being held in an older building this should be an easy win, just add a huge Christmas tree or hopefully the venue might have one if it's a Christmas party. Dress around it with beautiful dark wood furniture. The furniture seen in this image has Georgian and Rococo style references so don't worry about mixing eras, most dark wood vintage furniture will create the right vibe. 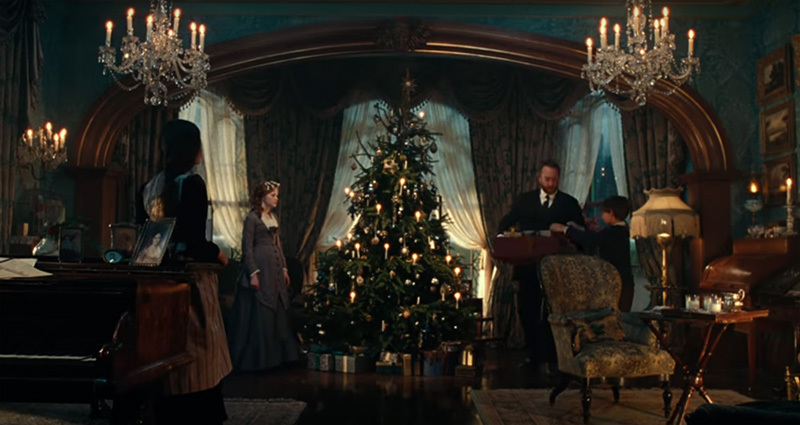 Add some humble wooden toys and presents wrapped in plain brown paper and silk ribbons under the tree, as Victorians didn't have huge amounts of Christmas decorations. 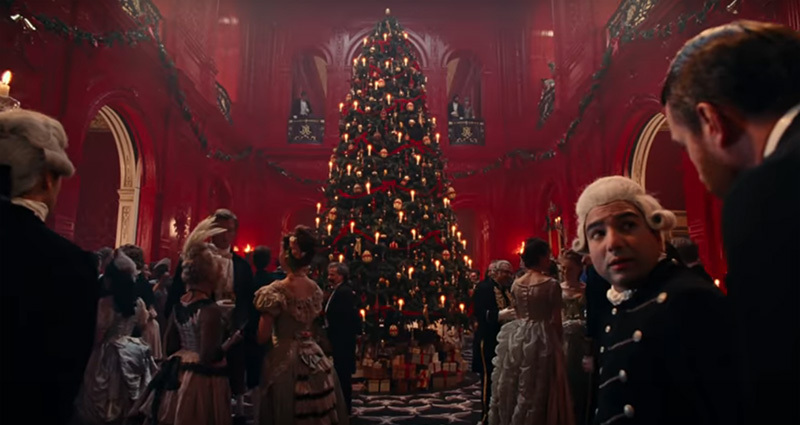 The scene shown here is that of a very well off family so very ornate lighting and lots of it would help recreate the atmosphere. Overall I don't think Victorian furniture is hugely pivotal with Nutcracker theming, but Victorian Christmas is definitely prevalent. Moving on to a beautiful mansion house with post-box red walls and plenty of gold, the props and furniture begin to get more elaborate at this stage. But again this might be a struggle to recreate unless you have a great big red hall. From what I can see here you would also need giant swans and stag antlers. I'm sure the film will enlighten me as to what is going on here when I come to design some props! Outside is all about the lighting again. I imagine as this is the start of the 'following of the rope' (not sure what to call that?) 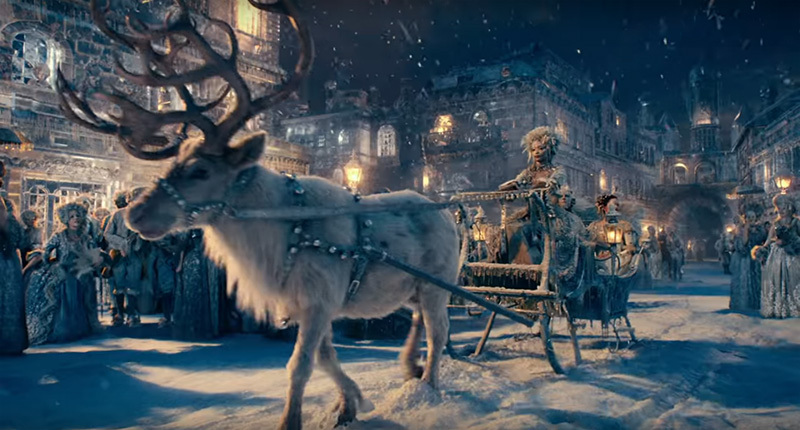 then this scene might make an appearance at a big, immersive Nutcracker event. On a little design note, I noticed the rope that is followed is ''gold cushion braiding with no flange'' if you wanted to know, and buy some in! The hedge maze can be made from low down boxwood hedges (which of course we can build) and sprayed with fake snow. The bandstand in the middle can be made, but it is on the big budget side of things. A more budget friendly approach would be making a backdrop or just the central red post. It is a beginning scene so if you were going for full venue theming then I would use this scene to theme a beginning area like a "meet and greet" area for canapÃ©s. 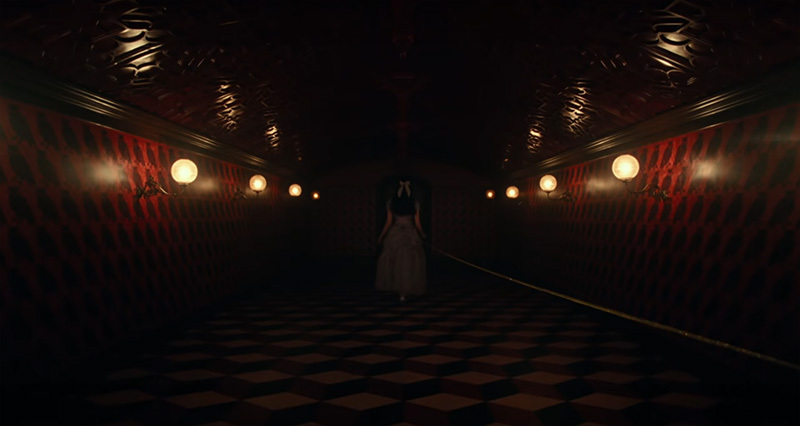 This scene below showing the blood red hallway with owl wallpaper changing to rats is very dramatic. 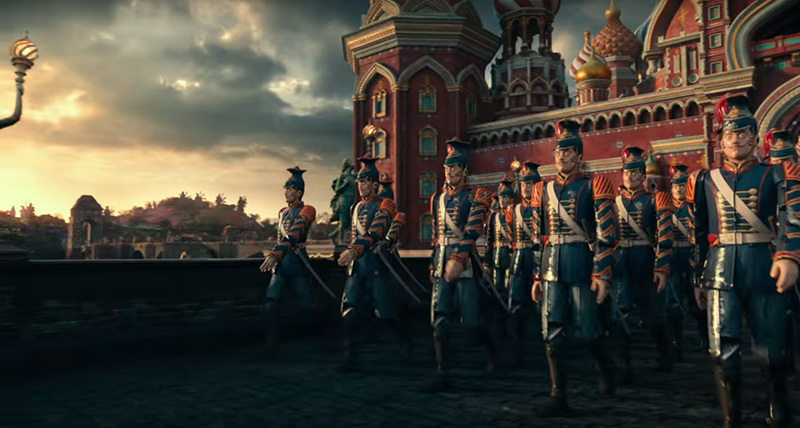 It features in the trailer so I'd imagine it will become pretty synonymous with the film. 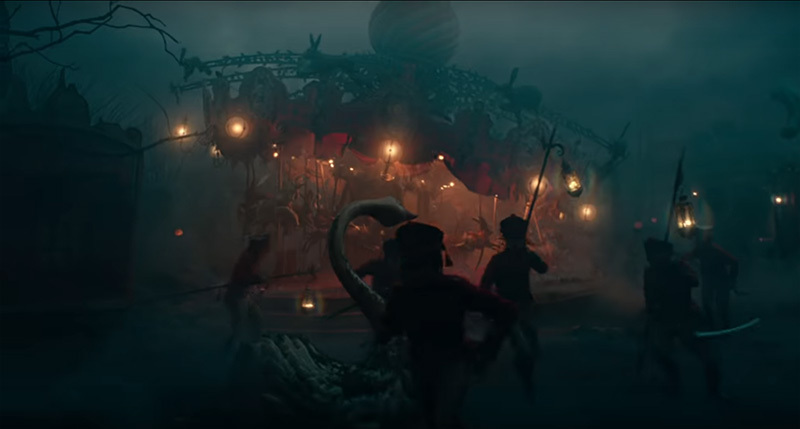 I think it is worth considering the use of owls and rats, which seem to be consistent imagery throughout the film. Maybe if you are sending out stationery there could be some subtle reference in there somewhere? The study! An amazing collection of scientific wonders. My personal opinion is that this study would translate into an amazing Victorian themed bar. 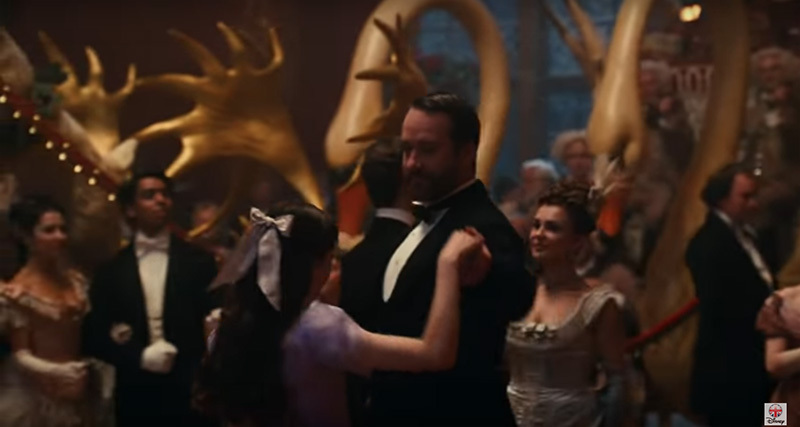 In the film The Greatest Showman there is a nice example of a Victorian bar I would take inspiration from, building mysterious scientific elements into it, stay with me here! So make some beautiful ornate wooden shelves and fill with 'specimens' and scientific equipment of the era (of course none of it real and all of it safe and fixed to the shelves). You could leave some of the shelving empty for bar use, or if your venue has a bar, create a fake bar front and prop dress around it. The Victorians were known for being explorers and collectors of worldly objects, and interests of nature. Again for an all out immersive experience have your bar company create themed drinks based on Victorian travel. 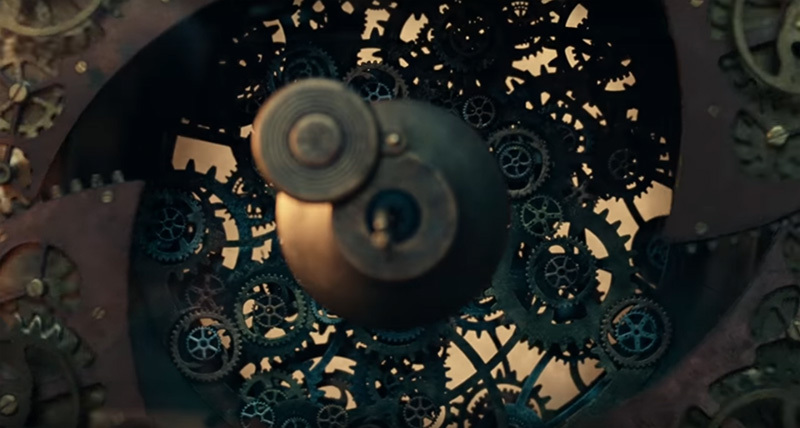 Clocks and cogs, another fun visual to incorporate into your theming seen here in the unlocking scene. Having just mentioned the idea of having a specimen themed bar, maybe a natural progression would be to have a mechanical inspired seating area. 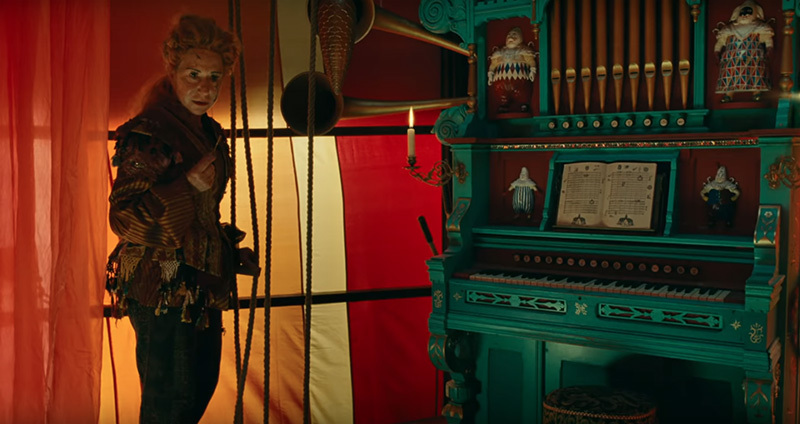 Lots of furniture with references to brass cogs, maybe a giant cog poseur table with a laser cut cog backdrop in front of black velvet draping? And brushed copper stools. Verging on the edge of steam punk there! 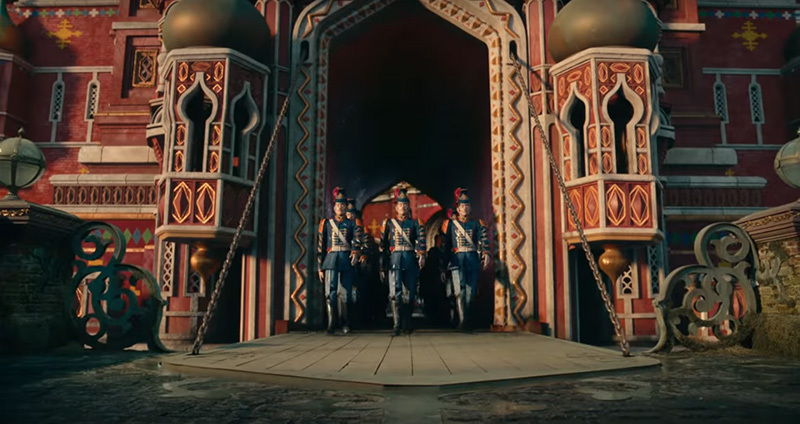 The most common theming I expect will be seen in what I call the 'event fallout' after a Disney film is released, would be The Four Realms. These are; The Land of Snow Flakes, The Land of Flowers and The Land of Sweets. The fourth realm doesn't seem to have a name but is very vintage funfair/circus inspired. 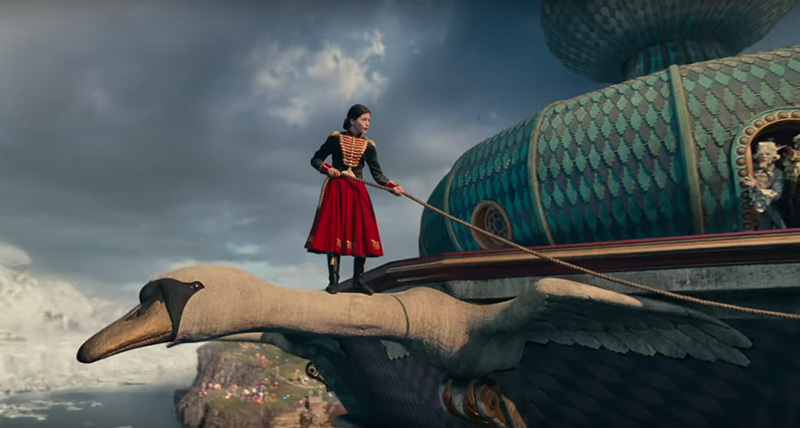 Maybe for the four realms you don't need to make them film perfect, rather just of that aesthetic. Flashback to all the Frozen parties! My propping suggestion for this would be any Victorian inspired outdoor prop covered in snow. Or maybe just a backdrop if keeping it simple. I'm sure there are a load of Frozen themed props out there that have been shelved a few years ago willing to make an appearance too! I love Flower Land! The cute little cottages at jaunty angles covered in flowers. There seem to be a lot of windmills too! There are so many prop ideas for this theme - lots of different sized pale pink plant pots with pink and purple little flowers in. Stone walls, fake grass, tall and thin fern trees, and if you want to go big, then some 8ft little cottages made in semi 3D from layers of wood and lots of flowers attached. The carriage pictured has a bit of a Georgian vibe to it, with elegant details and a powder blue undercarriage. 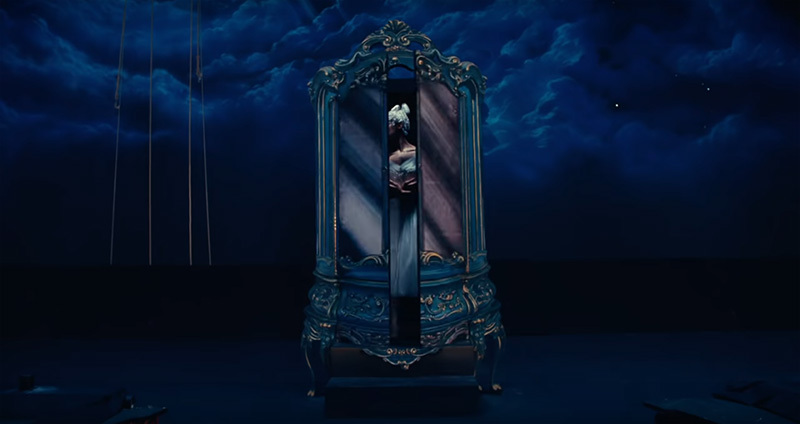 From seeing the trailer for this film to writing this blog I have been collecting furniture with hand painted flowers on, photo shoot coming soon! Isn't this the best sweet theming you've ever, ever seen? 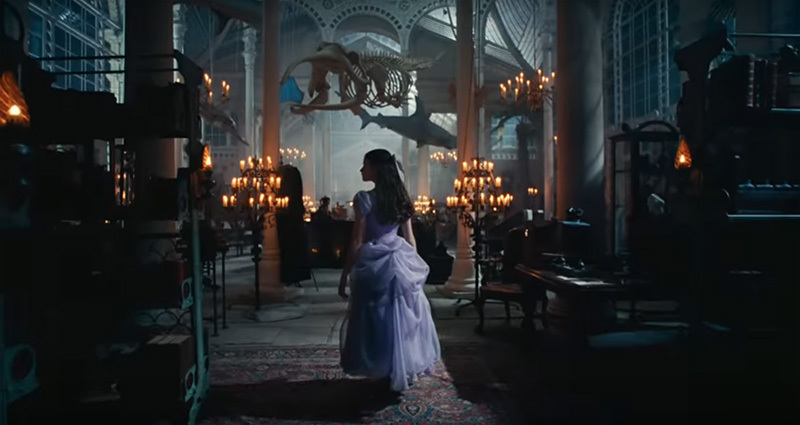 Forget Tim Burton's Charlie and The Chocolate Factory, forget Katy Perry's Californian Girls video, Disney has just upped the sweet propping game! This is what I'm most looking forward to creating props for. It's not just giant sweets, its sweet architecture on a massive scale. 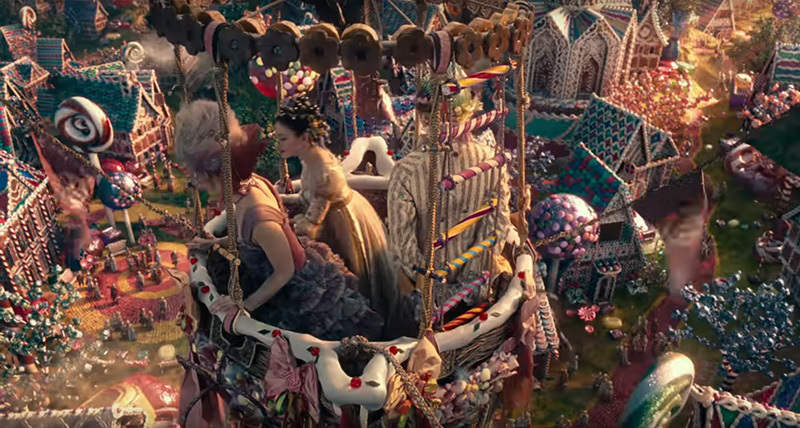 Imagine building a land with sweets rather than landing in a land of giant sweets. It makes me think of what the world gingerbread house championships would look like. 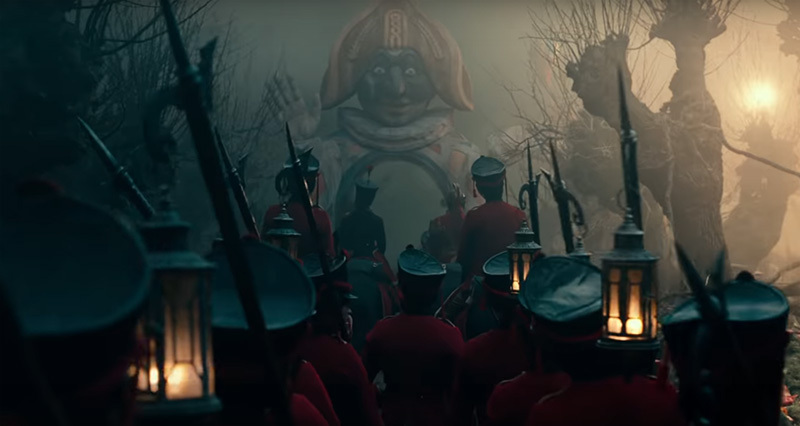 As mentioned before I'm not sure what the fourth realm is but I can guess it is the circus fairground land. This land is dark and eerie. Vintage circus with dark undertones depicted in the deepest forest on a black night. The land is worn and weary. 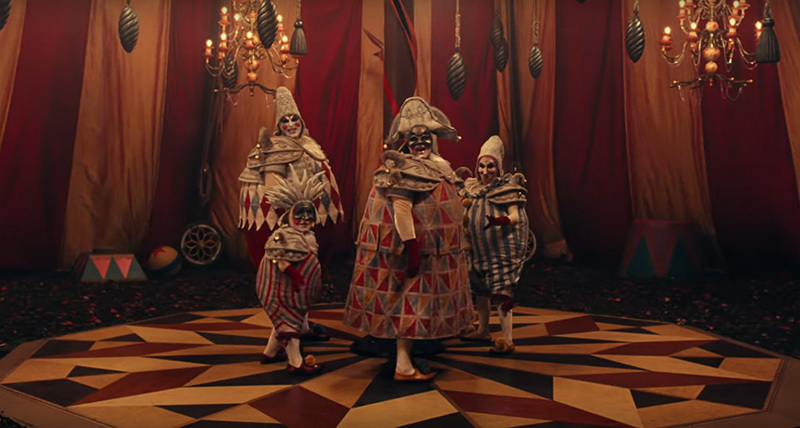 Any props used to recreate this would have to be aged, no new bright circus props. The key colours are red and yellow, and don't stray from these colours! No red and white circus tents or too many crazy circus colours. Inside the tent the decor is minimal. Lots of circus podiums, draping and ornate lighting with a beautiful central performance floor. 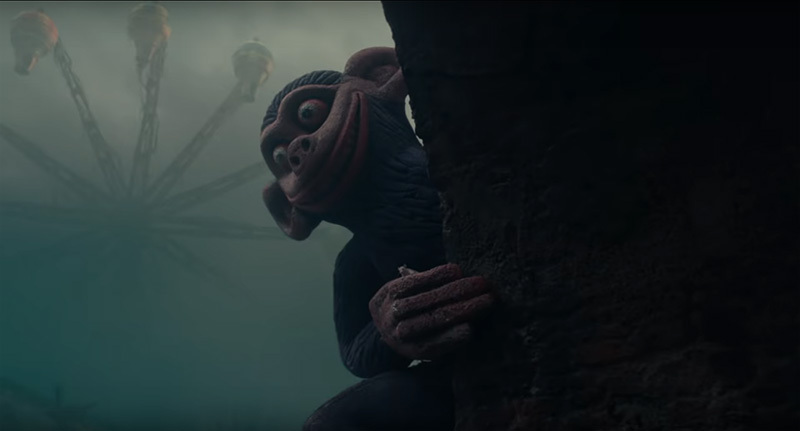 The entrance arch appears to be one of the odd jumping jack Russian doll type characters featured in the film. 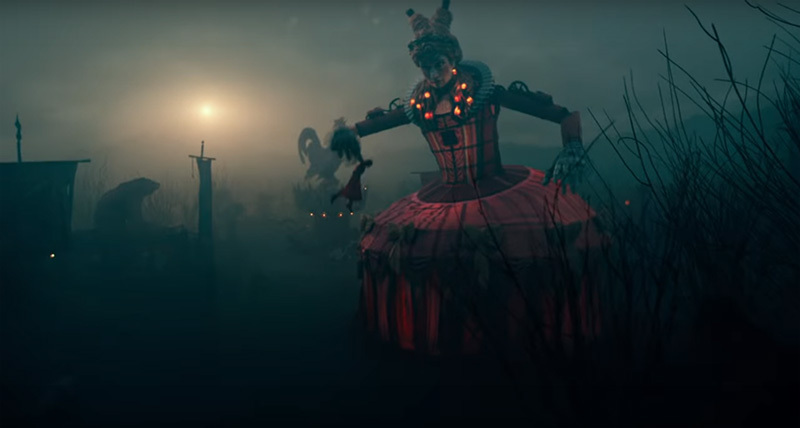 To theme this area, aside from the circus tent, I would create a black tree forest, add a fog machine and put static freaky large wooden toys amoungst the trees. Also add lots of moss, mushrooms and toadstools. There is definitely life and enchantment in this forest. Oh I wish we had the space to store a vintage carousel! Sadly we don't, but we can make wooden horses! The castle featured in the film is very Taj Mahal / Red Square. Beautiful Indian / Russian inspired details in a mix of opulent golds, reds and white. 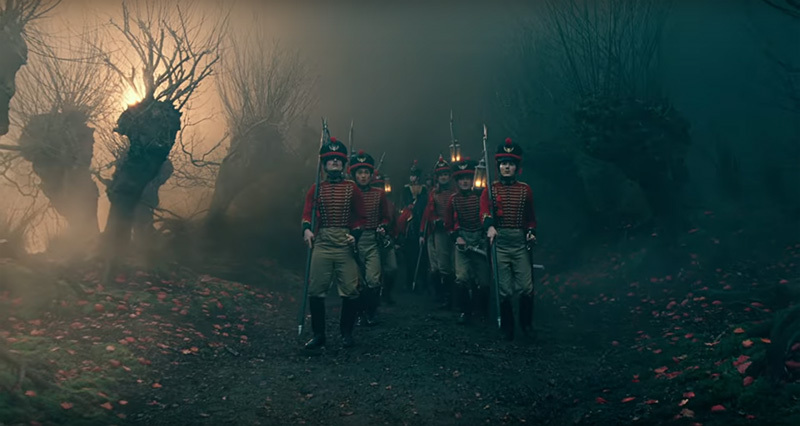 The film has sad dark undertones with death and decay, which you might choose not to feature at your event, unless your focus is on the dark side. It makes me really sad seeing the horse and swan rotting in the water. Maybe that's the prop maker in me wanting to rescue them! 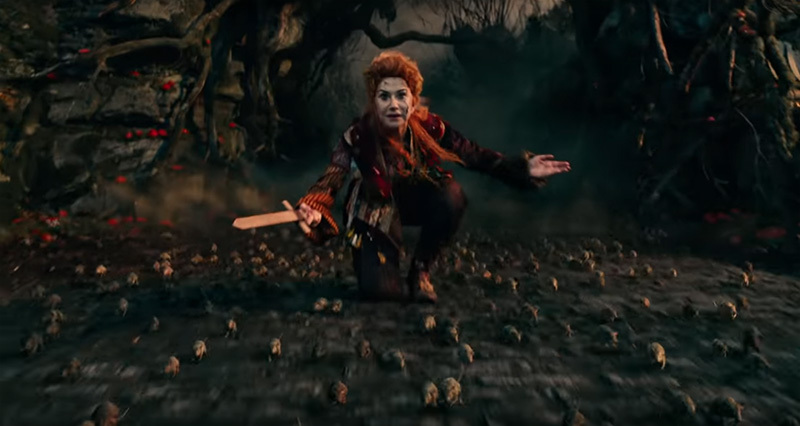 As previously mentioned there is plenty of enchantment in this film, so any use of fungi, twisted wood and tiny forest creatures will fit in well. 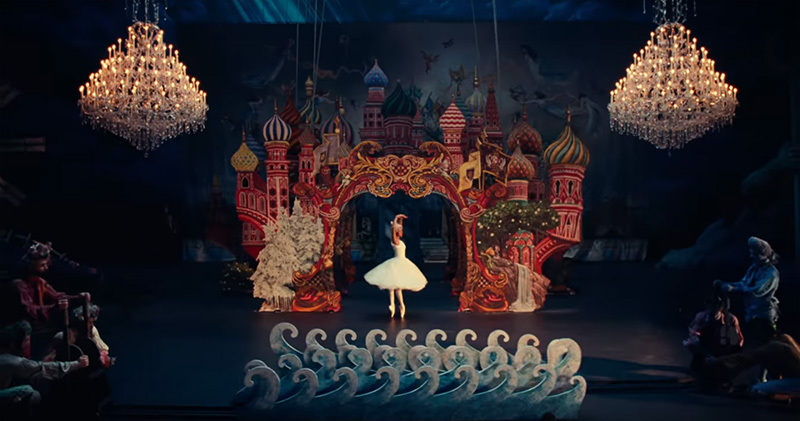 As if there isn't enough inspiration to weave into your event, the Nutcracker stage is an entire set itself. It would be utterly amazing to make some scenery flats like the beautiful fairy-tale castle seen here on the stage. What an entrance that would be to the event?! You can just about see the backdrop behind the castle too, dark, moody and magical. If you are decorating a children's party then I would stick to the stage set for inspiration. It has all the film elements but in a much more manageable set. You can see The Land of Sweet, The Land of Flowers, and the castle. 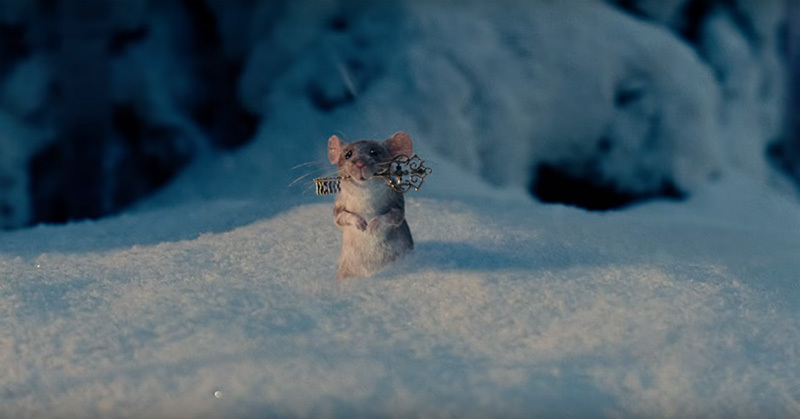 HAD to include this image of the mouse with the key, again I think it will become synonymous with the film. 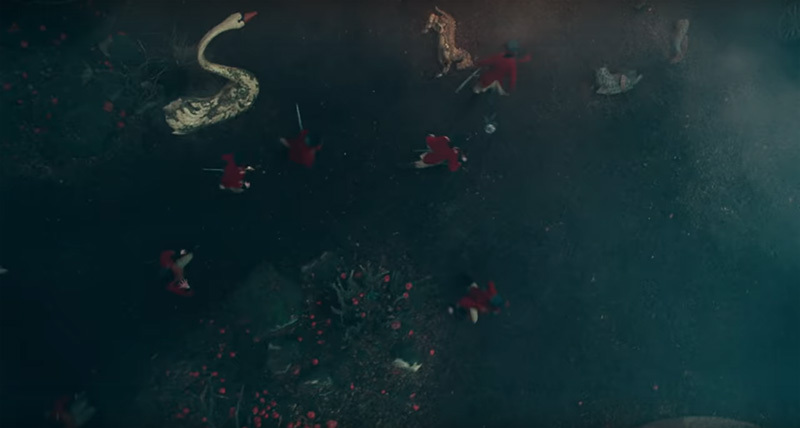 Not sure what is going on in this scene, but more swans! 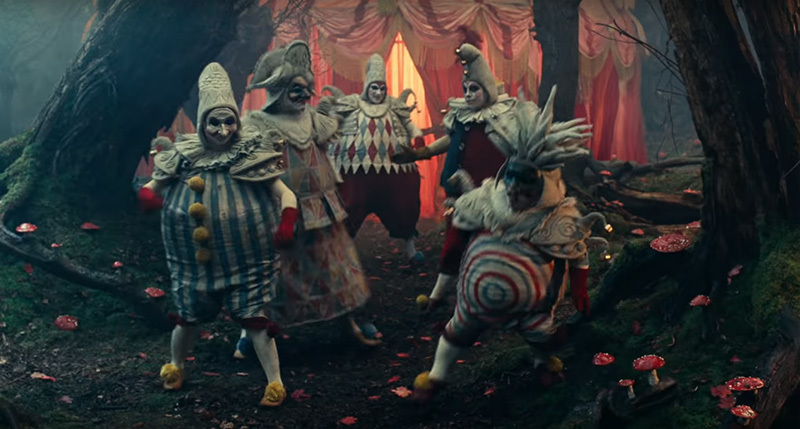 The animals featured in the film are swans, owls, rats, and a mouse. Plus references to horses and stags. I am gutted I found one for sale after seeing this film trailer, but I missed buying it. I would have made it into either a photo booth or entrance. It is so beautiful! Very very Rococo. I will keep looking! And these chairs! 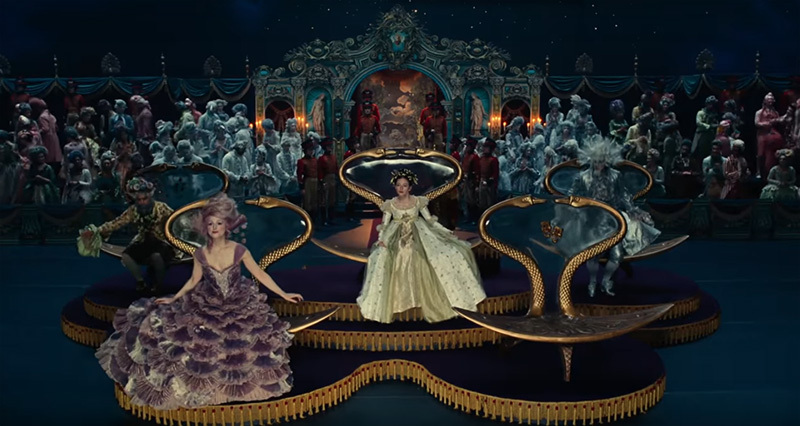 A pair of swan throne chairs would be amazing. Last image from the film, because I love the use of light here. Imagine using our Keyhole Entrance and looking through it into intriguing silhouettes and lighting down a hallway? Can't wait to start inventing prop ideas for this theme. Please message me to discuss. Pretty please, it is my dream theme. Prop designs coming soon!